Making this pie was a minor milestone in my life. It was the first time I've made a fruit pie, and it was the first time I've ever cooked with or eaten rhubarb (generously gifted by my neighbor). I think I love rhubarb now, but only with vanilla ice cream. It's very tart. The strawberries and sugar balance the tartness really well in this recipe, but I still think the pucker factor would be high without the healing balm of ice cream. Take a look at that, ladies and gents. A pan underneath the pie plate in the oven is a good idea. Served with a hearty scoop of vanilla ice cream, this pie screams "SUMMER!!" And my husband screamed "YUM!" 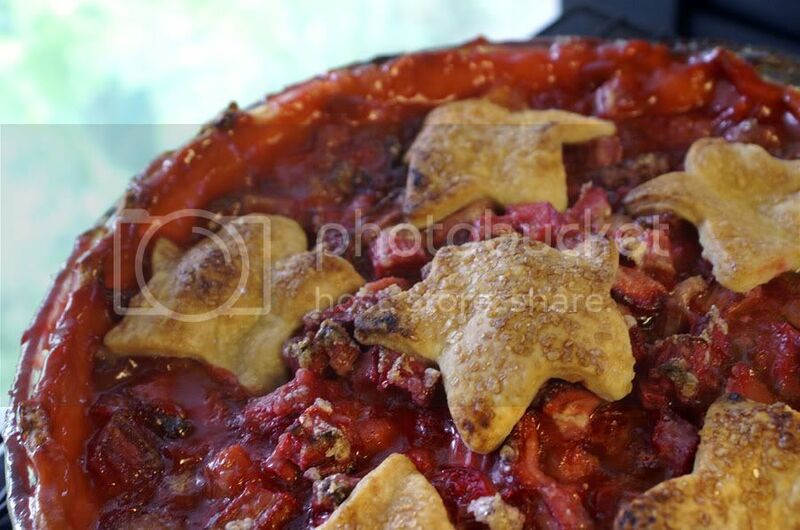 Scratch "fruit pie" and "use rhubarb" off my bucket list! Combine the flour, sugar and salt in the bowl of a stand mixer fitted with the paddle attachment. Mix briefly to blend. Add in the butter pieces and mix on medium-low speed to cut the butter into the flour until the mixture resembles coarse sand and the largest butter pieces are not much bigger than peas. Mix in the cold water on low speed just until the dough comes together. Whisk together the sugar, flour, and salt. 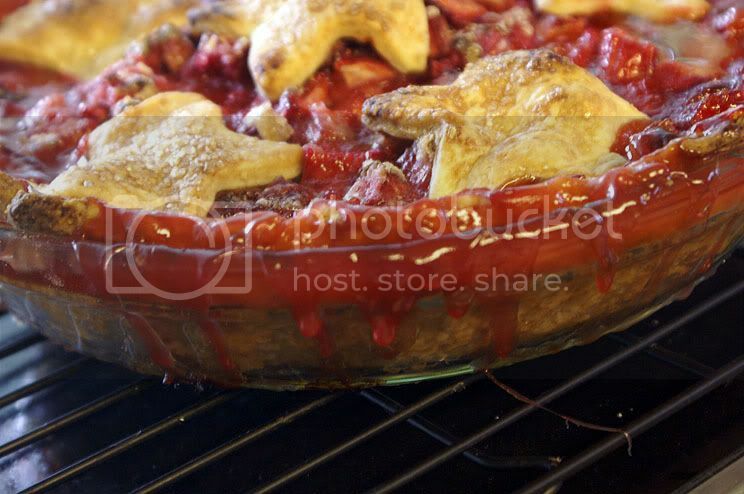 In a large bowl, toss the rhubarb and strawberries with the sugar mixture. Spoon the fruit into the pan, filling it about 3/4 full and mounding the filling a bit in the center. Place dabs of the butter atop the filling. Return the pie to the refrigerator. 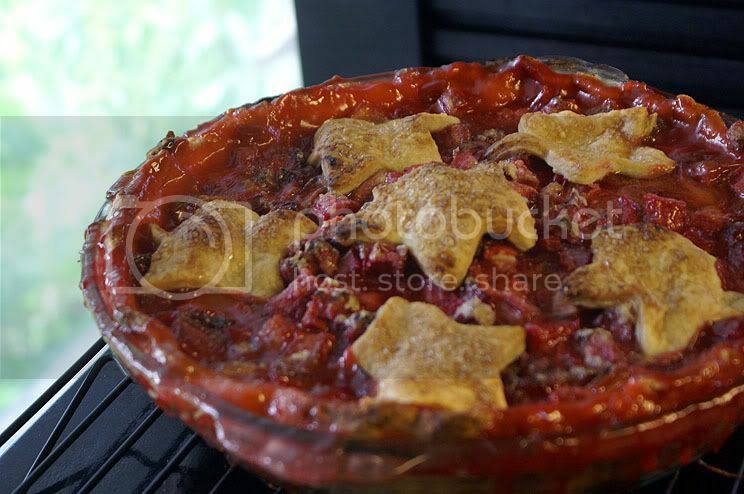 Roll out the remaining dough from the refrigerator, and cut it into star shapes. Place the stars atop the filling. Brush with water and sprinkle with coarse white sparkling sugar, if desired. Bake the pie for 30 minutes then reduce the oven heat to 375°F and bake for an additional 35 to 40 minutes (note: the middle didn't look done to me, so I baked it an addition 20 minutes -- use your own judgment here), until the filling is bubbling and the crust nicely browned. If you have a stainless steel crust cover, place it on top of the crust after 20 minutes to prevent the crust from browning too much. Remove the pie(s) from the oven, and let them cool for an hour or so before serving. The pie may be served warm, but it’ll be a bit messy; it sets as it cools. Top with vanilla ice cream or whipped cream, if desired. I made a rhubarb coffee cake which was yummy. My 1st time cooking with the stuff, never made a pie I think I will try this recipe sometime soon. it looks gorgeous! Thanks so much for your kind comment! I've never made rhubarb coffee cake -- sound delicious! I haven't delved too deeply into the wonderful world of rhubarb, but I do know that this pie was pretty amazing :).